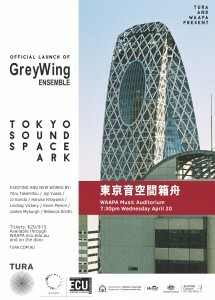 Tura New Music and WAAPA are proud to present the official launch of GreyWing Ensemble. Surrounding the GreyWing Trio of Lindsay Vickery, Catherine Ashley and Jameson Feakes, GreyWing Ensemble features innovative composer/performers and is a welcome addition to the new music landscape of WA. The concerts explore a moment in time (and place) in which the energy of a group of composers and performers results in a burst of creative and vibrant new music. Key works from these singular moments are then complemented by new music written by some of WAAPA’s most exciting recent graduates. Tokyo Sound Space Ark pays homage to Japanese modernist composers. Tura New Music’s annual program is supported by The State Government of Western Australia through the Department of Culture and the Arts, in association with Lotterywest and, The Australian Government through the Australia Council, its arts funding advisory body. Perth-based composer/performer Lindsay Vickery is a founder member of Decibel, Candied Limbs, SQUINT, HEDKIKR, Magnetic Pig and alea new music ensemble. He has performed throughout Europe, North America and Asia with groups and individuals such as Amy Knoles, Graham Collier, Jon Rose, Annie Gosfield and Roger Kleier, Marina Rosenfeld, Peter Knight, Mark Gasser, Sawada, Go Tsushima, Clocked Out, Ensemble Scintilla Divina, the MATA Ensemble and Ensemble Offspring. His music includes works for acoustic and electronic instruments in interactive-electronic, improvised or fully notated settings, ranging from solo pieces to opera and has been commissioned by numerous groups for concert, dance and theatre. He is the coordinator of Composition and Music Technology at WAAPA. Catherine Ashley is a dynamic and versatile harpist based in Perth, Australia. She completed her Bachelor of Music at the WA Academy of Performing Arts under the direction of Anthony Maydwell. In 2012 Catherine was invited to attend the International Harp Workshop (Italy), Catrin Finch Academy Summer School (Wales) and International Harp Summer School (England), where she studied under world-renowned harpists such as Elizabeth Volpe Bligh, Margherita Bassani, Brenda Dor-Groot, Sabine Meijers, Laura Caremellino, Catrin Finch, Elinor Bennett and Danielle Perrett. Catherine has premiered numerous new works, and is passionate about commissioning new music for the harp. In 2009 Catherine performed a sold out solo recital at the Darlington Town Hall where she premiered “Quickening” by Angus Barnacle (Netherlands). In 2012 Catherine performed the world premiere of “Peane from Hyacinth” (Concerto for Harp, Clarinet & Chamber Orchestra) by Evan Lawson with the Victorian Youth Symphony Orchestra for their 70th Year Anniversary Concert in Melbourne. Jameson Feakes is an Australian guitarist specialising in experimental and modern classical music. A graduate of the West Australian Academy of Performing Arts (WAAPA), he has received lessons and masterclasses from world renowned guitarists such as Johannes Möller and Timothy Kain. He is an ongoing proponent of experimental/new music in the Perth music community and regularly performs with the aim of introducing this music to a wider audience. His main musical projects concern exploring new possibilities for the guitar as an instrument that blurs the lines between contemporary and experimental music. Jameson also performs electric guitar in an improvisational context as a soloist and through groups such as the Perth iMprov Collective and his quintet Eszetts. Career highlights include his performance as a finalist at the 2014 Adelaide International Guitar Competition Australia’s most prestigious guitar competition, performing in the Helen Court Young Performer of the Year competition at WAAPA, as well as presenting a recital of new works for the solo guitar by Australian composers such as Nigel Westlake. Currently he is studying an honours degree at the University of Western Australia, preparing repertoire to release in 2016, as well as continuing to regularly perform around Perth both as a soloist and with various ensembles.